All the autonomous cars that have been made in the world have run on petrol, diesel, CNG or use grid-based electricity to charge. This new autonomous car is based on solar power, and therefore naturally has several sets of advantages over the rest autonomous vehicle inventions of the world. There is also absolutely no autonomous vehicle that is built on 15 lakh like this bus. The bus is charged using solar panels that line the vehicle. The bus is supposed to sense its surroundings and the road and drive itself. The panels can generate two kilowatts of power and help charge the six lead acid batteries that it is equipped with. The bus charging is so strong that it can sustain to run for upto 70 kilometers in one charge. The 1,500 kg bus can accommodate up to 10 to 30 people and can be used inside closed campuses. It has a speed of 30 kilometers per hour and uses Bluetooth and GPS for the purpose of navigation. The bus can be used to control over a radius of 10 kilometers. They can be deployed to places which need low-range pollution free vehicles like airports. The price of this driverless bus might set a good benchmark for commercial automakers for the upcoming months. 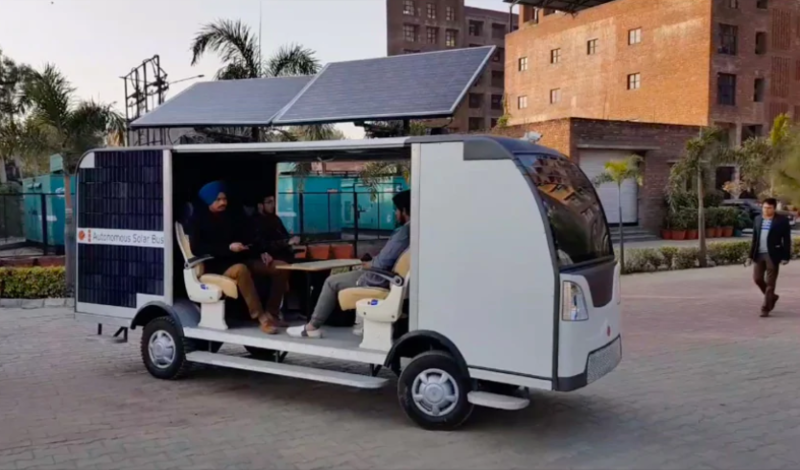 The project group which made this driverless solar powered bus had previously, in the year 2014, built a driverless golf cart and they thought to built this driverless vehicle this year. The whole project of the driverless bus took a year to complete. About 300 students and 5 faculty members fabricated the bus at the workshop, within the University campus. The students from mechanical, computer and electrical engineering with assistance from professors of the college. Although the car does not compete with the other giants inventions of autonomous vehicles, it sure is a breakthrough since it is uses solar power, and the country should look forward to these buses taking over our city roads.